Testing distributed systems is hard. In this article I will cover the approach and supporting technologies we are using to conduct rapid and effective distributed systems testing for Deter. The first thing to be aware of when testing a distributed system is the environment in which the testing itself will taking place. Here I define an environment as the interconnection and configuration of hosts and network appliances e.g., computers, phones, switches, routers, access points etc. - and how they are connected. What does the network infrastructure look like in the target deployment environment? What are the salient aspects of that environment relative to the testing that we need to accomplish? Is the environment itself dynamic? The underlying engineering question we must answer to get started down the path to effective testing is: - How do we capture answers to these questions in a model? Once we can concretely express a model of our network environment to test our distributed system in, we can move on to considering how to materialize that model. How does one go from a model of an interconnected topology to a realization? Can the environment be realized purely through virtualization technologies? How to differentiate between the network infrastructure that supports the use of the realization (ssh access, remote SCM such as Ansible) versus the infrastructure under test? The focus on holistic models of interconnected topologies as opposed small groups of hand wired machines is what sets the Raven virtualization technology apart from others. Once a model has been materialized and it’s elements configured, we must mount our software within that environment. As developers, we typically have a machine set up to modify and build code on. How do we synchronize build artifacts from our development environment with installation locations within the environment under test? The idea is that we want to build like usual and have the testing infrastructure automatically deploy build artifacts into the testing environment. This way we can run tests immediately upon successful build without having to specialize the build for the testing envrironment, ultimately leading to a virtuous build-test-modify cycle. But wait, what about distributed testing? There isn’t much out there in the way of multi-language frameworks to help out with this. This article will also introduce the Walrus Testing Framework that is designed specifically for that purpose. In the article that follows, I am going to walk through a complete example of modeling, materializing, mounting, building and testing a small distributed system that is itself a network infrastructure system. The system under test is a VLAN management system for Cumulus Linux. Here is the system diagram. The basic function of this system is to regulate connectivity between hosts on a network through virtual LANs. The implementation is distributed across a control agent and an implementation agent. The control agent issues the commands required to achieve a desired virtual LAN setup (using the QBridge protocol) and the implementation agent carries out those commands by configuring the Cumulus switch using Netlink. The control agent can exist anywhere on the network and there is one implementation agent per switch. The topology defines our components and their interconnections, and the configurations contain the scripts and files necessary to bring up each element of the topology to a state that is functional w.r.t. our test goals. The first thing we need to do is define our nodes. Nodes and switches are defined in the exact same way. Consider the definition of the controller and the Cumulus switch below. This code defines nodes in terms of their operating system images and what mounts we would like created. The next step is to define links between nodes. This is done as follows. This code uses more nodes than we defined above, reference the full source for details. And finally we must define a topology object which is a composition of all of the above. The Raven configuration subsystem uses Ansible. Raven projects are based on workspaces. A workspace is simply a directory that contains a file named model.js that contains the components discussed above and directory called config that contains a set of Ansible playbooks. Any Ansible playbook that corresponds to the name of a node will be automatically launched on that node by Raven. See this directory for example. The file named nimbus.yml will be run on node start up by Raven on the nimbus node. This assumes you have set up Raven on your system. Getting setup is pretty simple. Here is a quick rundown of how to start the raven system that is described in this post and also included in the raven sources as an example. This particular model assumes that we have the following code repositories in a top level directory called /space. The fetch.sh script referenced above will do this for you. You will need to clone these projects into /space for this tutorial to work. Once these steps complete we will be in a position to test the system! The testing we are going to show here for the VLAN management system, tests that connectivity between the two nodes n0 and n1 can be effectively managed by the controlling agent via the implementation agent. We are using the walrus testing framework. The first part of the test is the test definition file. This is a JSON file that defines the tests that we are going to run. Here is a snippet from the actual test file in the Raven project. WalrusTF adopts a driver model when it comes to language support. Right now there are drivers for C, Python, Perl and Bash. Contributions for other new languages are always welcome! The test we are working with now uses the Bash driver on the n0 and n1 nodes. The code is very simple, it just tries to ping some node repeatedly on a 1 second interval. If the ping is successful, an ok diagnostic is sent to walrus with the hostname of the participant running the test. If the ping is not successful a warning diagnostic is sent. 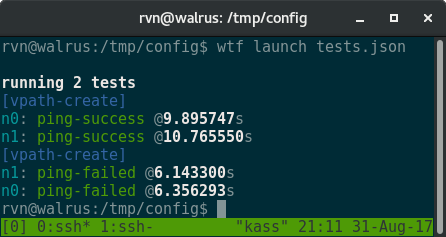 In concert with the ansible test launch script, the walrus test definition script now asses whether or not the VLAN control system is doing its job by attempting to create and then destroy virtual network paths between n0 and n1 and observing the results of the ping tests. The walrus test definition wraps all this up in an automated easy to launch and observe test case. What we have shown here today is a way to rapidly model, materialize and enter the code-build-test cycle for distributed systems. 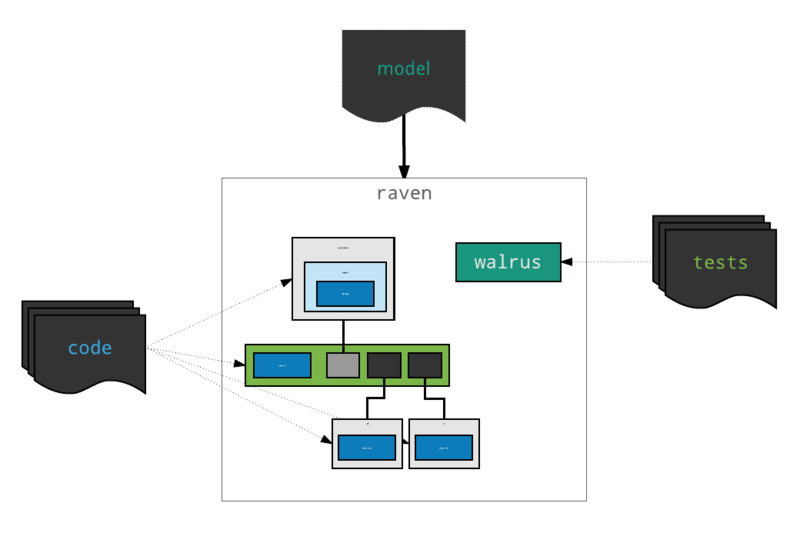 Please check out the raven and walrustf projects and try them out for your own distributed systems engineering problems. Contributions and comments welcome.